Juicy apple pork burger with leek and a apple-cherry tomato relish! Check out this tasty creation, which is one of the favorite recipes I put into my cookbook! Super easy to make and wow what an explosion of flavor! I present you with a delicious pork burger that has apple and leek in the patty, which makes it extra juicy! A big dollop of homemade apple-cherry tomato relish on top. Well, you know this one is going to be good! By now, you probably know that I love me some good pork! Apple and pork go really well together and the juice of the apple keeps the burger nice and moist. Plus, with rosemary being pork’s best friends, you can never go wrong in the first place. For this and other tasty combo’s check out my new book Flavor Math – A guide to understanding and creating delicious flavor combinations. The relish is also super easy to make. It’s basically just throwing everything in a pot and waiting for the magic to happen. As always, I prefer to use a griddle pan for my burgers. This not only gives you those nice looking grill marks, but also chars the burger giving it a hint of smoky flavor. And now, get cooking and make some tasty tasty burgers! Oh yes!! 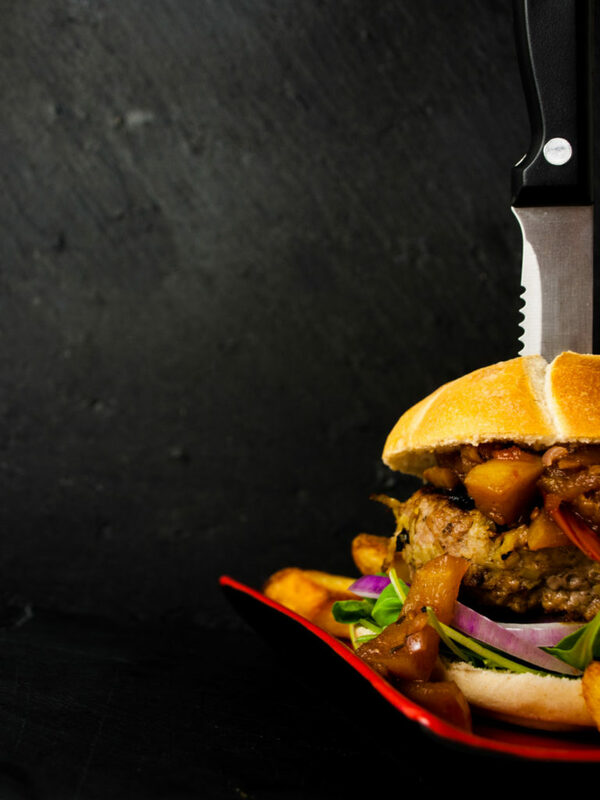 This apple-pork burger shouts “Eat me already! !” so badly! Finely slice up the leek. Peel and grate 1 of the apples. Mince 2 cloves of garlic. Put a small pan on medium heat. Add the butter, the grated apple, minced garlic and the nutmeg. Simmer for 5 minutes until everything is soft. Add the rosemary and remove from heat. Let it cool for a few minutes. Mixed the cooled apple mixture with the minced pork and season generously with salt and pepper. Divide the mixture into 4 even portions and form into thick burger patties. Cover the patties with cling film and rest in the fridge for 30 minutes to let the flavors infuse. Chop up the remaining 2 apples. Dice the remaining 2 cloves of garlic. Dice 1 red onion. Get a sauce pan and add the apples, garlic, red onion, cherry tomatoes, sugar, balsamic vinegar, cider, as well as 1 teaspoon of salt. Bring to a boil, reduce the heat and let simmer for 25 minutes. Stir occasionally until everything is thickened. Grill up and assemble some tasty burger! Put a pan on high heat – I prefer a griddle pan. When almost smoking hot, add your chilled pork burgers to the pan. Brown the burgers for 5 minutes per side. In the meantime, slice up the remaining red onion. Assemble your burgers by placing lettuce on the bottom-half bun, adding a grilled pork patty, topping with sliced red onion rings, and slathering it with a big spoonful of the relish. Plate up your delicious creations immediately and serve ‘em with fries. Get messy! Let me know what you think about the recipe in the comments below! Did you ever had a burger with fruit in the patty? If so, did you like it? Think this burger is missing something? Let us know in the comments and let’s try to make this recipe even better than it already is! You can find this and 65 other surprising combinations in my new book Flavor Math – A guide to understanding and creating delicious flavor combinations.